In 1924 William Herbert Lee “Herb” McCourtie began to transform his family’s 42-acre farm into a gracious summer home fit for a gentleman and his acquaintances, both illustrious and somewhat shady. It was in Somerset Center, and he called it “Aiden’s Lair.” As well as more conventional additions to the home and property were seventeen bridges, two bird houses intended for purple marlins and two chimneys, all made in the style of trabajo rustico, using cement to create wood-like sculptures. (CLICK HERE for more about this art form.) The cost for the renovation and expansion of a simple farmstead into a rich man’s hideaway exceeded $500,000, an impressive amount in those days. McCourtie also entered into the stuff of legends during the era of Prohibition when his property was reportedly used for more daring purposes than a summer retreat. The rather impressive personal worth of Herb McCourtie was partly driven by his own initiative and partly by fortuitous circumstances that he took advantage of. He learned first hand that he had no interest in the back-breaking work involved in running a farm and decided he’d rather be a lawyer. He graduated from the University of Michigan Law School in 1894, eventually ending up in Dallas, Texas in the early 1900s, where he used his law degree to write oil and gas leases. Intrigued by the quick money to be made in “black gold,” McCourtie daringly decided to speculate in oil. His success started him on the path that would lead to the amassing of a personal fortune. With part of his profits McCourtie turned to the making of cement, a less glamorous, but more stable undertaking. This venture resulted from a chance encounter. He said that while he was in a hotel in Chesaning he overheard a man talking about the money to be made in the manufacturing of cement. As the conversation progressed McCourtie realized that one of the key ingredients in cement, marl, might be what he’d seen on his uncle’s farm. He headed back to Michigan and had soil from the farm tested—finding, indeed, marl. He was on his way to becoming a cement magnate. Inconclusive but still strong evidence indicates that in 1898 McCourtie was involved with the Peninsular Portland Cement Company in Cement City, a short distance from his uncle’s farm. His partner in the venture was William Foster Cowham, a cement plant designer and engineer. As well as being a part owner, McCourtie was (probably) president of the company. His personal fortune began to grow and he moved his family to a mansion in Jackson. But the old family home in Somerset Center beckoned. It had been bequeathed to McCourtie’s oldest sister, Blanche, and she willingly sold it to him. Herb McCourtie transformed it into a rich man’s summer place. His additions to the house included a 26 x 42-foot ballroom, above which was his bedroom, a bath and a guest room …with ten beds arranged dormitory-style. Cement played a major role in the renovation. Along with the more conventional uses of this material, brought from nearby Peninsular Portland Cement, were a swimming pool and trout pond. 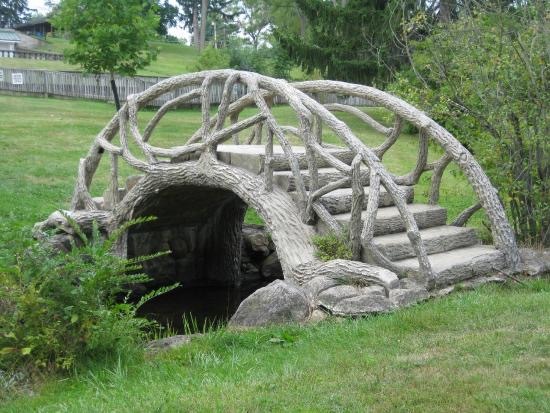 However, it was the use of cement for the trees, bridges and bird houses that made the property unique. It was probably when McCourtie worked in Texas that he became aware of the Mexican folk art of trabajo rustico. Artisans of this craft George Cardosa and Ralph Corona were invited to Somerset Center to create a cement wonderland that endures to this day. Seeking to attract purple marlins he also requested two bird houses. Like his farmhouse-turned-mansion, one bird house went way beyond utilitarian. With various avian “apartments” in one, it cost $2,200 … and we need to remember this was in the late 1920s! However, it was an underground room that has given rise to rumors that are unconfirmed, but fun to contemplate. Into the side of the hill that faces Goose Creek and was out of sight of the traffic on US-12 or casual passers-by, McCourtie placed a building . It was referred to as a “rathskeller,” meaning a beer hall that was underground. It was fabulous! Inside was a fully functional English-style bar, with brass foot rails, hand hewn ceiling beams, leaded windows and dark oak-paneled walls adorned with swords, spears and shields. A swinging door led to a card room that was rumored to be the site of all-night poker parties, one reportedly attended by Henry Ford. So far this sounds like no more than a luxurious masculine retreat. But the fact that it was Prohibition and the presence of a ten-foot square vault next to the rathskeller that was accessed through a 300-pound door with a combination lock and an inner grilled, brass door locked by a key make it hard not to let your mind run wild with the illegal possibilities. It hardly seems like that vault was a place for storing preserves. Suspiciously, there was a hidden opening above the underground building. With a trap door opening to steps that led into the vault, this would have been an ideal liquor drop spot. Patrons of McCourtie’s (alleged) upper-class speakeasy—who could have included such underworld legends as Al Capone—could park unseen from US-12 in an underground garage. But far from being a gangster, Herb McCourtie, from all reports of people who knew him, was a generous man who threw lavish parties and unselfishly shared his lovely estate with the people of Somerset Center. Unfortunately he died at the Battle Creek Sanitarium at age 61 after a long illness. A series of owners of Aiden’s Lair were unable to keep up the large estate, and in 1987 Somerset Township purchased the property. The house eventually had to be razed, but an army of volunteers cleaned the area of brush and debris and eventually restored the grounds to their former glory. In 1991 McCourtie Park was listed in the Michigan Register of Historic Places and then listed in the National Register of Historic Places. In 1999 Melinda LoPresto, who had been working with the cement sculptures at St. Joseph’s shrine, down the road on US-12, was hired to renovate the cement sculptures at McCourtie Park. Today, thanks to volunteers, it has become a tourist attraction visiting by many people each day.